Proper sizing is necessary for comfortable heating and cooling. You’ve heard the old adage “bigger is better”, and you’ve probably heard “bigger isn’t always better in heating and cooling” well actually both can be true. You may be saying to yourself, how can both be true when they are contradictory? Stick with us as we explain. When a homeowner is looking to have a heating and cooling system installed in their home it is likely they will hear some different terms used by the HVAC world.These terms are BTUs or British Thermal Units and to state how much space can be heated and cooled by a particular component of the system. These terms are BTUs, or British Thermal Units, and tons, which actually equate to 1,200 BTUs. BTU is a measurement of energy or heating produced and commonly used when speaking about heating capacity of a furnace or heat pump. A ton or tonnage is the more common term used when talking about cooling. Typically the larger the home the higher both figures will need to be for the equipment to heated and cool your home. Are they always equivalent? Without going too deep into HVAC info that will like lose anyone’s interest the answer is no, depending on different factors a home may require more cooling than heating or vise versa. The painful terminology talk was to help you understand that there are different “sizings” in HVAC. 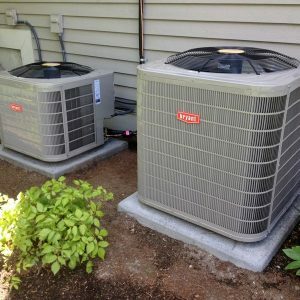 The capacity (above terms) of a air conditioner should not change much when looking at different options for your home. What your home needs for cooling and heating capacities are what it needs for you to feel comfortable. What “size” will change with options is the physical measurement of the equipment. Air conditioners and heat pumps in the 90s did well to reach efficiency rating of 10-13 SEER. A SEER simplified is an average rating of how efficient a cooling system operates over the cooling season. Today’s high efficiency air conditioners and heat pumps are reaching 18-20+ SEER. This is largely due to the ability to disperse the heat pulled out of your home by the refrigerant system. To maximize this heat release process the condenser (AC) coil has been enlarged over years of improvement. Essentially the idea is the larger the amount of surface space that can come in contact with outdoor air the better the AC or heat pump will be at releasing heat from your home. The one exception to this is Bryant’s Evolution V series 189BNV air conditioner and 288BNV heat pump, find out more information about these two units by clicking on the links. So when you look at your neighbors new AC and compare it to your old one, you’ll probably see a difference in size. If their home is very similar sized, it’s probably not that they decided their old AC wasn’t cutting it and you should wonder the same. It’s more likely they saw the benefits in higher efficiency and that’s the real reason for the larger physical size of their new cooling system. When it comes time to for you to look at an air conditioner replacement, look at options. Most reputable companies in Lincoln NE and surrounding areas offer free estimates and the good ones are willing to provide you with options. If you call Bryant our estimators will take the time to provide you options and make sure all your questions are answered about each. It’s our job to be knowledgeable about the equipment we offer in hopes that it will make your decision of what right for you easier. Is now the right time for an estimate for your furnace and air conditioner replacement? Complete our contact form and we’ll be in contact soon to find a time that will fit into your schedule.